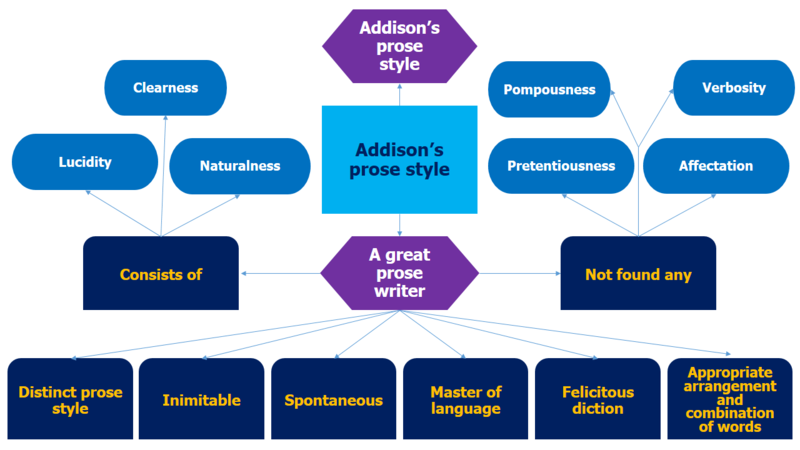 “…because in order to write like Addison, one must possess the qualities of character which Addison possessed- his loving nature, his placid temper, his careful avoidance of excess of any kind. Felicitous choice of vocabulary and an equally felicitous arrangement and a combination of words mark his prose style. Upon this I began to consider with myself what innumerable multitudes of people lay confused together under the pavement of that ancient Cathedral, low beauty, strength, and youth, with old age, weakness and deformity lag undistinguished in the same promiscuous heap of matter. In this case, therefore, it is not religion that sours a man’s temper, but it is the temper that sours his religion. Humility and Patience, industry and temperance are often, the qualities of a poor man. Humanity and good nature, magnanimity and a sense of honor are as often the qualities of the rich. He has not used high figurative expressions. The fanciful or the high flown similes are almost absent in his essays. But he uses similes, metaphors, and antitheses in his own homely and modest way. Such figurative expressions have been useful for him to drive a point home to the reader. He is almost laconic and terse in the use of figures of speech. In the essay, “Periodical Essays”, he describes that “an essay-writer must practice in the chemical method and give the virtue of a full draught in a few drops”. On Cheerfulness he says, “Mirth is short and transient, cheerfulness fixed and permanent”. Addison has often indulged in moralizing but he never grows vehement or passionate like a pulpit orator. He maintains restraint and never becomes intense or vehement. He is eloquent without being rhetoric. Like Bacon, his essays are full of allusions– historical, literary, Biblical and mythological; quotations from various sources, parable, fables, anecdotes, and analogies are freely employed by him to clarify and reinforce his arguments. In “Friendship,” he has a lot of quotations from Tully, Bacon, Confucius, Cicero, and Martial. His essays show his power to enrich his writings with allusions and quotations from ancient and modern literature. One of the striking qualities of his style in essays is his humor, which becomes in effect a fine irony. The “Female Orator” is a masterpiece of his humor. His study of society, especially that of women’s character is mildly satirical. His humor does not evoke serious laughter and is, therefore, neither offensive nor stinging. Yet he has attacked social vices and follies no doubt, but it is not directed to any individual- men or women. He makes use of irony not to hurt but to make others aware of their characteristic faults. He was not as furious as the other writers of his age. Addison is said to have been very fastidious in the choice of his words. True that he has taken much pain to polish and balance his sentences and achieved thus a refined style. He faithfully maintains the rules of art and never deviates from them.